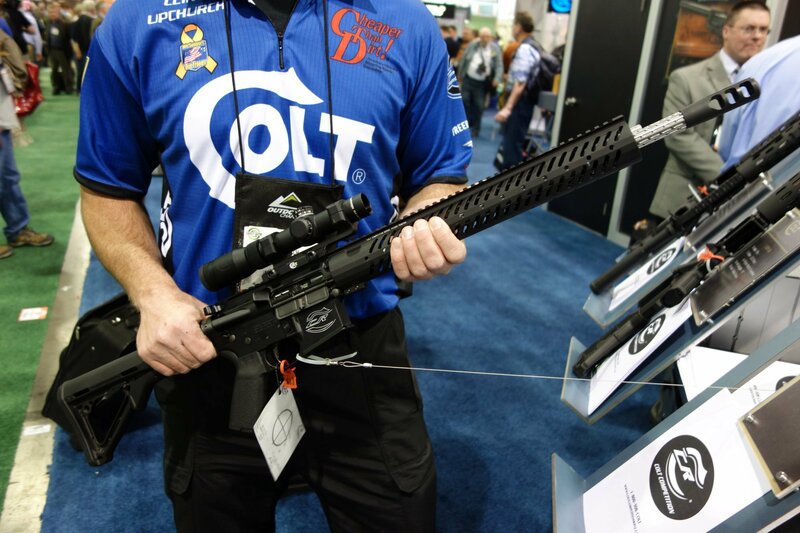 Colt Pro CRP-18 and Pro CRP-16 AR-15 Carbine/Rifles for Tactical 3-Gun Competition/Competitive Shooting: Adjustable Gas System, Geissele SSA-E Trigger, and Fluted Barrel! (Video!) | DefenseReview.com (DR): An online tactical technology and military defense technology magazine with particular focus on the latest and greatest tactical firearms news (tactical gun news), tactical gear news and tactical shooting news. 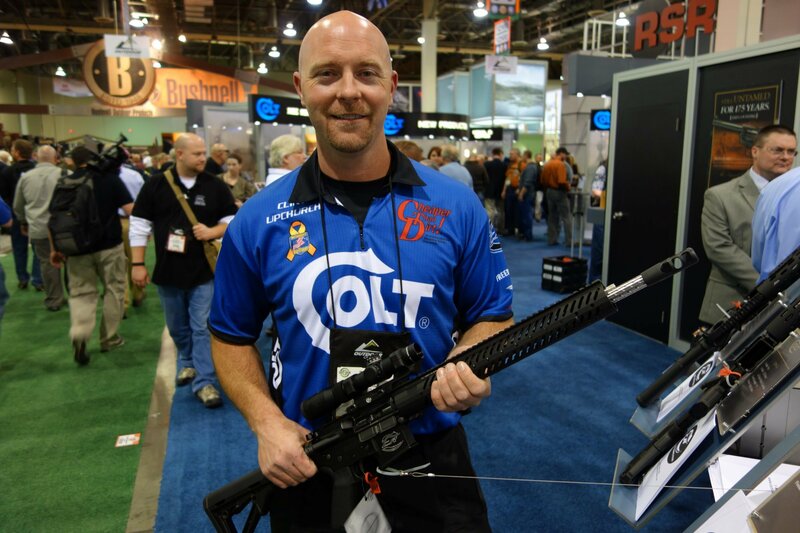 Clint Upchurch of the Colt 3-Gun Shooting Team was kind enough to take DefenseReview (DR) through the Colt Pro CRP-18 (called the "Colt CR Pro" in the embedded video, below) semi-auto-only, direct-gas-impingement (DGI) AR carbine at SHOT Show 2013. Since this 18-inch (18")-barreled rifle/carbine was specifically developed by Colt Competition Rifles for 3-Gun competitive shooting, it comes with all the bells and whistles, just like th Colt Pro CRP-16 with 16-inch (16") barrel. The barrels on both guns are fluted for weight reduction, by the way. Both guns feature Colt's proprietary and very cool toolless adjustable gas block/gas system, and are relatively lightweight (competition) ARs thanks to the fluted barrels and lightweight modular rail systems. The muzzle brake/compensator also looked interesting. If you're looking for a 3-Gun AR, they're definitely worth taking a serious look at. Editor's Note: One of the reasons we wanted to take a look at these guns at SHOT was because one of our contributors' expressed an interest in it's out-of-the-box viability for 3-Gun competition, as it looks like a well-thought-out package. Defense Review likes the handling qualities of this gun, although we haven't run it at the range, yet. The Geissele Automatics SSA-E (Super Semi-Automatic Enhanced) two-stage match trigger is excellent, as are all Geissele triggers. Obviously, a great trigger is crucial on any competition gun, and DR is a big fan of Geissele's. Assuming the Colt Pro CRP-18 and Colt Pro CRP-16 go bang every time you pull the trigger and are accurate they're claimed to be, the guns should be winners. Magazine Capacity: 30 Round Magpul mag included. 10-rd aluminum mag for MA, NJ. Fixed 10-rd mag for CA. – Full-length Integral Picatinny top Handguard Rail. 1 – 2" Accessory Rail. – Magpul MOE Grip with Extended Backstrap, Magpul Enlarged Trigger Guard – Geissele Two-Stage Match Trigger (Super Semi-Automatic Enhanced) Model SSA-E. Breaks at ~3.5 lbs. – Each Colt Competition Rifle is test fired for accuracy. – Accuracy Guarantee: 3-Shots in 1" or Less at 100 yds (with specified factory ammo). – A signed, serial numbered and dated test target is included with each rifle. – Shipped in a Custom Colt Competition Rifle-marked cardboard shipping box with Instruction manual. – Also ships with a Safariland Cleaning Kit with a custom Colt Competition Rifle Cleaning Kit case. – California, Massachusetts and New Jersey compliant models are available. – Please contact Colt Competition at 1-855-308-2658 (COLT) for more information. – Scope, scope mount and sights not included." “Gen-2″ Lancer Systems L5 Translucent Advanced Warfighter Magazine (AWM): Truly-Translucent Polymer 30-Round AR-15 Rifle/Carbine/SBR Mag! DR Action Video! Colt IAR (Infantry Automatic Rifle) 5.56mm NATO Mag-Fed AR: Light Machine Gun/Squad Automatic Weapon (LMG) Proposed Replacement Fired on Full-Auto at the Range!